Practicing more current affairs quizzes will provide an extra energy among IAS aspirants. For practice, we have provided here the current affairs quiz quite useful for IAS Prelim Exam 2017. Current affairs have become an important section of IAS Prelims Exam and it has to be covered on daily basis. The practice of current affairs quizzes is very important for IAS Prelims Exam preparation and it helps to immense confidence among IAS aspirants. 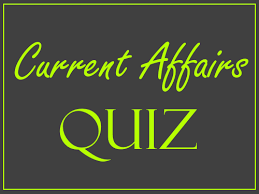 Here, in this article, we have provided a list of current affair quizzes quite important for IAS Prelims Exam preparation. I. Digital India Corporation (DIC) will lead and guide in realising the vision, objectives and goals of the Digital India program. II. To ensure autonomy and viability of the organisation, in the long run, the DIC, will also collaborate and mobilise partnerships with the industry, to evolve revenue based models for service delivery. III. The judicious mix of talent will ensure that government is equipped with a broad spectrum of resources for the successful design of Digital India related projects. Digital India Corporation (DIC) will lead and guide in realising the vision, objectives and goals of the Digital India program. It will provide the strategic support to Ministries/Departments of Centre/States for carrying forward the mission of Digital India by way of Capacity Building for e-Governance projects, promoting best practises, encouraging Public-Private Partnerships (PPP), nurturing innovation and technology in various domains. To ensure autonomy and viability of the organisation, in the long run, the DIC, will also collaborate and mobilise partnerships with the industry, to evolve revenue based models for service delivery. To undertake these functions, Digital India Corporation will attract talent and resources both from government and market. The judicious mix of talent will ensure that government is equipped with a broad spectrum of resources for the successful design of Digital India related projects. I. India recorded a growth of 7.9 per cent in 2015-16, as compared to 7.2 per cent in 2014-15 and 6.5 per cent in 2013-14. II. In terms of the Global Competitiveness Index (GCI) prepared by World Economic Forum for 138 countries, India ranked 39 in 2016-17, as compared to India’s rank in GCI of 60 (among 148 countries) in 2013-14. The key initiatives of the Department of Economic Affairs, Ministry of Finance taken in the past 3 years have led to Improvement in India’s Macroeconomic Stability. Today, India is one of the bright spots among the major countries in the subdued global economic context. India recorded a growth of 7.9 per cent in 2015-16, as compared to 7.2 per cent in 2014-15 and 6.5 per cent in 2013-14. Predictions by expert agencies suggest that India’s growth rate is set to improve further in 2017-18. In terms of the Global Competitiveness Index (GCI) prepared by World Economic Forum for 138 countries, India ranked 39 in 2016-17, as compared to India’s rank in GCI of 60 (among 148 countries) in 2013-14. I. Under Pradhan Mantri Krishi Sinchai Yojana, a record coverage of 8 lakh 40 thousand hectares has been brought under micro irrigation during the year 2016-17. II. Under the National Agriculture Insurance Scheme, six crore farmers have got insurance for the Kharif season during three years of 2011-14. III. The Pradhan Mantri Fasal Bima Yojana has increased the number of non-loanee farmers by 238.96%. • Food grain production of the year 2016-17 has broken all previous records. This year, the growth rate in agriculture and allied sector has been approximately 4.4 %. • According to 3rd advance estimate for 2016-17, the total food grain production is estimated to be 273.38 million tonnes which are 8.67 % higher than that of the year 2015-16. • It is also worth mentioning that this production is also 6.37% higher than the average production of last 5 years. • For pulses, the production during 2016-17 is expected to be 22.40 million tonnes which will be a record production till date and is higher than that of the year 2015-16 by 37%. • Under Pradhan Mantri Krishi Sinchai Yojana, a record coverage of 8 lakh 40 thousand hectares has been brought under micro irrigation during the year 2016-17. • Under the National Agriculture Insurance Scheme, six crore farmers have got insurance for the Kharif season during three years of 2011-14. Among them, there was only 77 lakh non-loanee farmers. While in the 3 years between 2014 and 2017, 9 crore 47 lakh farmers were insured for the Kharif season, of which 2 crore 61 lakh are non-loanee farmers. The Pradhan Mantri Fasal Bima Yojana has increased the number of non-loanee farmers by 238.96%. And in the last three years, the number of non-loanee farmers increased by 128.50% in Rabi Crops compared to the preceding three years. I. The index for eight core industries (comprising crude oil, natural gas, petroleum refinery products, coal, electricity, cement, steel, and fertilisers) registered 4.8 per cent growth in 2016-17 (April-January) as compared to 3.4 per cent in 2015-16 and 4.5 per cent in 2014-15. II. The Index of Industrial Production (IIP) is an index for India which details out the growth of various sectors in an economy such as mining, electricity, IT, Infrastructure and manufacturing. III. All India IIP is a composite indicator that measures the short-term changes in the volume of production of a basket of industrial products during a given period with respect to that in a chosen base period. As per the Second Advance Estimates of National Income 2016-17 released by CSO on 28th February 2017, the growth rates in Gross Value Added (GVA) of the industrial sector were 5.8 per cent in 2016-17, 8.2 per cent in 2015-16 and 6.9 per cent in 2014-15. The index for eight core industries (comprising crude oil, natural gas, petroleum refinery products, coal, electricity, cement, steel, and fertilisers) registered 4.8 per cent growth in 2016-17 (April-January) as compared to 3.4 per cent in 2015-16 and 4.5 per cent in 2014-15. The index for eight core industries (comprising crude oil, natural gas, petroleum refinery products, coal, electricity, cement, steel, and fertilisers) registered 4.8 per cent growth in 2016-17 (April-January) as compared to 3.4 per cent in 2015-16 and 4.5 per cent in 2014-15. The Index of Industrial Production (IIP) is an index for India which details out the growth of various sectors in an economy such as mining, electricity and manufacturing. All India IIP is a composite indicator that measures the short-term changes in the volume of production of a basket of industrial products during a given period with respect to that in a chosen base period. 5. Recently, an Exhibition ‘Return of the three stone Sculptures from Australia to India’ has been organised in the National Capital of India. It was organised to mark the safe return of which of the following stone sculptures from Australia to India? An exhibition “Return of the Three Stone Sculptures from Australia to India” has been organised in National Museum, Janpath New Delhi on 23 May 2017. The exhibition is organised to mark the safe return of three stone sculptures (Seated Buddha, Worshippers of Buddha, Goddess Pratyangira) from Australia to India. These sculptures were purchased by National Gallery of Australia from the Nancy Wiener, New York in 2007 and Art of the Past, New York, 2005. Mahesh Sharma, Minister of State for Culture and Tourism attended a special event at National Gallery of Australia (NGA) in Canberra, Australia in which Senator Mitch Fifield formally handed over three ancient artefacts stolen and smuggled out of India and inadvertently acquired by National Gallery of Australia.